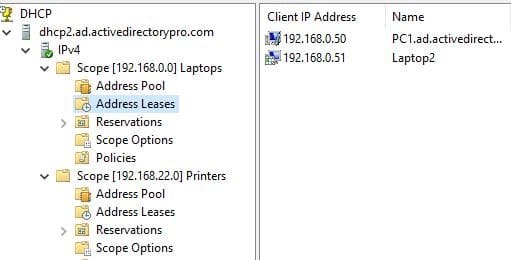 In this tutorial, you will learn how to backup and restore Windows DHCP server using the DHCP console and PowerShell. 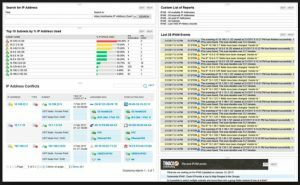 Have you ever experienced a DHCP server crash or failure? All is calm until devices start rebooting. Users will complain that they can’t access email, the internet stops working and their apps no longer work. That’s because the DHCP server is down and they are not getting connected to the network. It’s really easy to spin up a new DHCP server but do you remember all the scopes you need to re-create? What about those reservations, did you memorize all those MAC addresses? Let’s check out how to backup your DHCP server for a fast recovery. 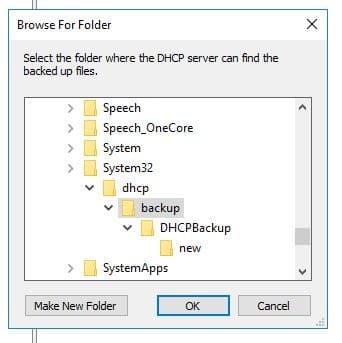 By default, Windows will backup the DHCP configuration every 60 minutes at this location %SystemRoot%System32\DHCP\backup. 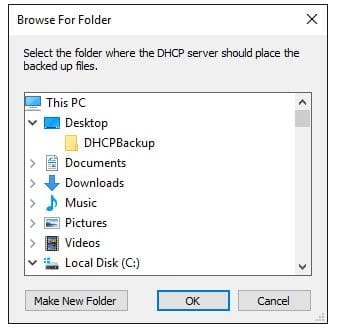 Important Tip: Although Windows automatically backs up the DHCP configuration it will do you no good if the server crashes and you are unable to access the file system. It is recommended to either change the location to a network share or use backup software to backup the folder. You could also schedule a task to copy the backup folder to another location. If you don’t like videos tutorials or want more details, then countinue reading the instructions below. In this example, I’ll be backing up the DHCP configuration on server DHCP1. Later in this tutorial, I’ll be restoring this backup to server DHCP2. Unfortunately, there is no confirmation that the backup completed. You can go open the folder and verify data was backed up. I can see that files were written to the folder, looks like the backup completed successfully. That is it for manually backing up the DHCP server. Now, let’s move onto the restore process. 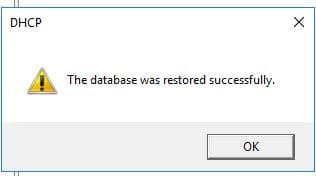 Important Tip: You must copy the backup folder from the steps above to %SystemRoot%System32\DHCP\backup or you will get the following error saying the database was not restored correctly. I’m logging into my 2nd DHCP server with the hostname of DHCP2. You will get a message that says the service must be stopped and restarted. You can go browse the scopes to verify everything restored correctly. I have a small lab but I can see the two scopes, leases and reservations all restored. This example I’ll be logged in locally to the server. Use the following command to backup the DHCP configuration using PowerShell. Backup-DhcpServer -ComputerName "dhcp1" -Path "C:\DHCPBackup"
Remeber the backup has to be copied to “C:Window\ssystem32\dhcp\backup” or you will get permission errors. 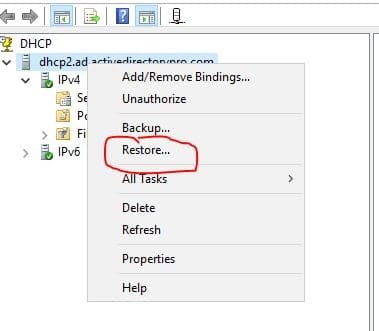 PS C:> Restore-DhcpServer -ComputerName "dhcp2" -Path "C:Windows\system32\dhcp\backup"
That completes the backup and restore process using PowerShell. 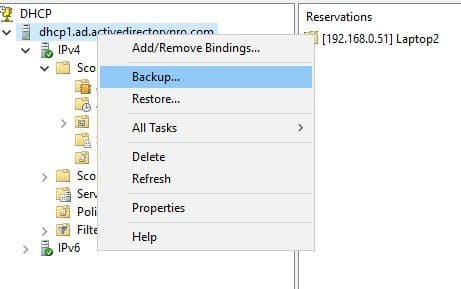 If you need more PowerShell assistance with these commands see the Restore-DhcpServer and Backup-DHCPServer reference guides. 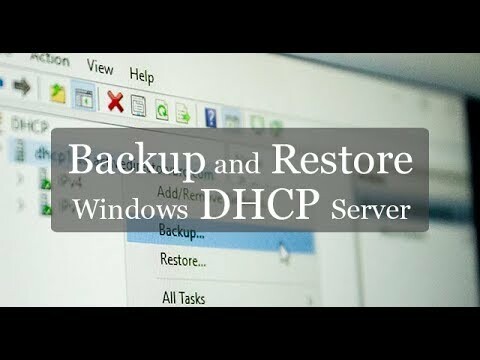 I hoped this article helped you learn how to backup and restore Windows DHCP servers. Let me know what you think by leaving a comment or questions below.